If you’re an online entrepreneur who uses WordPress, you’ve probably heard about Thrive Themes. But in case you’re not familiar with the brand, the unique selling proposition of Thrive Theme is that they build “conversion focused” themes and plugins for WordPress. In this Thrive Themes review, I’ll explain to you just what that means, together with everything you need to know about Thrive Themes – and exactly what you get when you purchase a Thrive Themes Membership. That said, I found that one of the most bothering questions often asked by 90% of new bloggers is… How can I choose the perfect WordPress theme for my site? And if you've been looking for an answer to this same question, then I want you to know that you're not alone as most of us have also been there at one point in time. Maybe your website looks like it was last updated in the '90s, and you want to have a good looking site without hiring costly website developers – or you just want to get more email subscribers for your business. Regardless of your reason for reading this post, one thing is sure – you want an excellent looking and conversion-focused blog. Behind every successful WordPress site is a quality theme. However, the problem is that there are thousands of different WordPress themes out there to pick from, and they all differ in price and features. As a result, it’s usually difficult to choose the one that’ll give your site exactly what you want. Good enough, Thrive Themes is one WordPress theme that is frequently advertised as one of the best available at the moment, and that’s because of its professional look and feel. According to Adobe, about 38% of website visitors leave and stop engaging with a site with poor design or layout. Imagine a visitor landing on your blog for the first time and finding it hard to read your blog posts because of poor design. He’ll simply abandon your site and look for the same information elsewhere. Hence, the reason to always ensure you have a great looking site. Admittedly, there are so many premium WordPress themes out there, but Thrive Themes has an unmatched advantage over most of them, especially due to its conversion focused abilities. You'll never make a mistake by trying any Thrive Products. Get Thrive Themes and Plugins Today. 1 Thrive Themes Review | What’s it all About? 1.2 What Else is Included With Thrive Themes Membership? 2 Thrive Themes Pricing | what’s the Cost? Thrive Themes Review | What’s it all About? Thrive Themes is a collection of robust WordPress Themes and Plugins developed by Shane Melaugh, the same man behind many other marketing tools including Hybrid Connect, SE Cockpit, and the blogger behind ActiveGrowth.Com. Traditionally, when you pay for a premium WordPress theme, you’ll get exactly the theme you paid for – but Thrive Themes is a bit different. Instead of paying a one-time fee for a premium WordPress theme, you’re paying an annual membership fee that gives you 100% access to several WordPress themes and plug-ins. Interestingly, with a Thrive Themes annual membership, you gain access to all their themes. Thrive Themes currently have 10 WordPress themes – and each of their themes is built for clarity, speed, and readability. Apart from the fact that Thrive Themes are also beautiful; they put more attention on conversion elements instead of design appeal. Some of their WordPress themes are built for magazine-style blogs while others are meant for selling products and services – and there are also themes suitable for both individuals and organizations. The FocusBlog theme is one of the best WordPress themes I’ve ever used. It’s lightweight, easily customizable, mobile responsive, search engine friendly, and gives your website a professional look and appeal. This is another professional blogging theme that focuses more on media-rich elements such as videos, images, and audio. 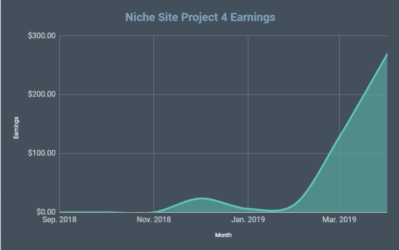 The Rise theme puts more focus on having a clean layout and is meant to be a blogging theme for use with product sales and affiliate marketing websites. Performag is Thrive Themes’ first magazine theme. It is designed specifically for magazine style websites and is well optimized for ad revenue, user engagement, and social sharing. 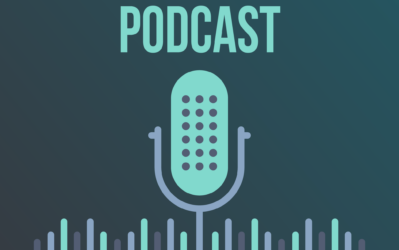 Voice focuses more on podcasting and blogging and features a unique header-less design. 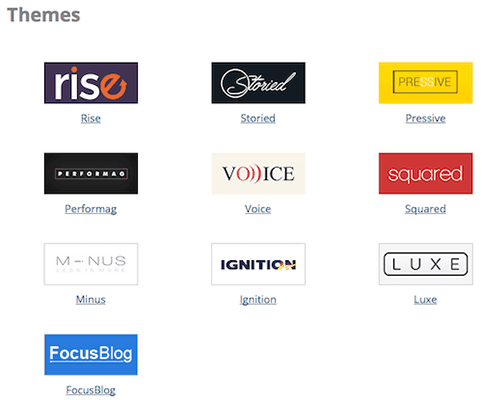 Voice houses authors' portfolios on the left column, making it ideal for personal branding. The Luxe theme looks like a modern-day fashion magazine. If you’re selling luxurious products or services, and wish to go for Thrive theme, Luxe is the ideal theme for you. Pressive is a WordPress theme that focuses more on creating blogging and marketing related websites that feature big amounts of multimedia. Ignition puts the majority of its emphasis on building sales and product pages. Ideally, if you’re planning to create an e-commerce store with Thrive Themes, you’ll be happy with the Ignition WordPress theme. Squared is a multipurpose WordPress theme that is built to be eye-catching and bold. Every element from the ground up is designed to try and grab your reader’s attention. With the Squared theme, you now have the opportunity to make your website striking to the eyes while also having all the conversion best practices in place. Minus is a minimalist WordPress theme that tries so much to put your content front and center. It has a bunch of white space with little distractions. As you can see, you get quite a few different themes with your Thrive Themes membership. However, that’s not all that you receive. What Else is Included With Thrive Themes Membership? While you can always purchase themes and plugins individually, Thrive Themes Membership actually gives you a better value by putting everything together under a single plan. With the Thrive themes membership, you’ll have complete access to every one of their themes and plugins. Thrive Architect (formally known as Thrive Content Builder) – a beautiful visual, drag and drop page builder. Thrive Leads – a detailed email sign-up forms builder with a range of helpful functionalities that go beyond most list building WordPress plugins. 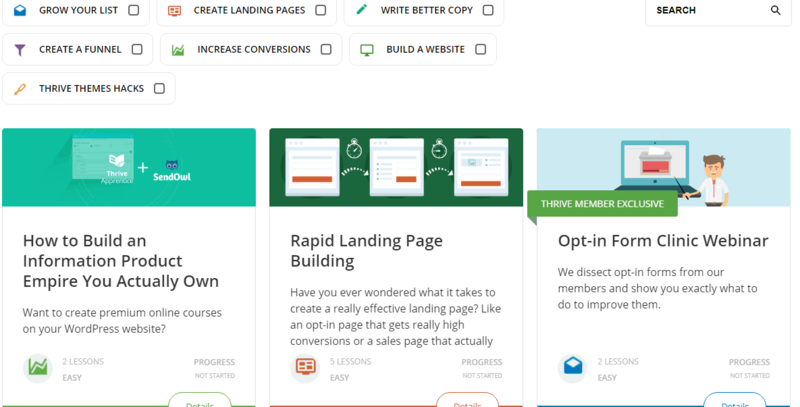 Thrive Headline Optimizer – helps you to A/B test the titles of your blog post. 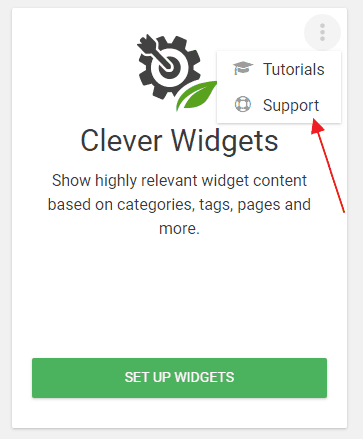 Thrive Clever Widgets – helps you to display different widgets on your blog based on tags, categories, etc. Thrive Ultimatum – Use for creating evergreen countdown timers to drive urgency. 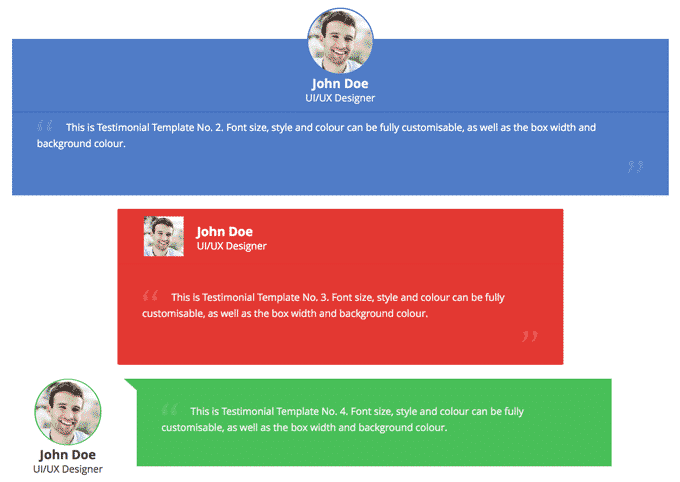 Thrive Ovation – helps you collect and show well-designed testimonials on your website. 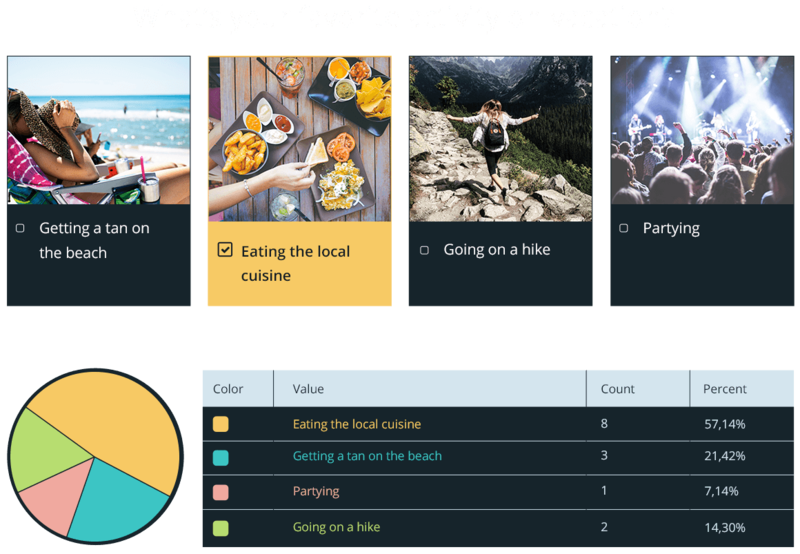 Thrive Quiz Builder – for creating interactive quizzes…and show offers or add visitors to your mailing list based on their answers. Apart from all the products from Thrive Themes, you’ll equally have access to Thrive University, which is a range of courses created to help you master digital marketing. Some of the courses are free, while others are available as part of the membership. I’ve never gone through University so that I won’t dwell so much on it for my Thrive Themes review. In the remaining section of this post, I’ll be going over every single product in detail, so you get to know more about Thrive Products to know precisely the ones you need for your business. Thrive Architect (Formally known as Thrive Content Builder) is one of the most popular WordPress plugins in Thrive store. The plugin lets you create custom WordPress posts and landing pages via a drag-and-drop user interface. You have the ability to create your own designs from the ground up or load up one of the many prebuilt landing page templates. When you open a page template in the Thrive Architect interface, you can easily click on its elements to edit them, with lots of useful controls instantly coming up in the sidebar once you’ve clicked on an editable item. Aside from that, Thrive Architect is also a front-end builder, which means you get to see your page as your visitors would while you’re working on it – and because you’re not required to switch browser tabs to see a preview of your work, the design process is very fast and responsive. Thrive Architect differs from most other landing page builders out there because it comes with stunning template sets. If you’re in the habit of writing long-form content like me, it makes more sense to always give your readers a way to jump from one section of the content to another. This will help to give your audience a good user experience — and that is where inserting Table of Contents comes in. With Thrive Architect, you can easily add a customizable table of contents to your blog posts. Just use h2 and h3 tags for your sub-headings, and they will all display in a table of contents box. Thrive Architect allows you to create a call to action (CTA) buttons within your pages to increase your click-through rates. Whether you’re building a mailing list or recommending certain products to your audience, your call to actions plays a huge role. Here’s where using large, eye catchy buttons can help. With this WordPress plugin, you can easily add CTA buttons with your desired color, text and fonts. The content box lets you differentiate your content from the rest of the copy. These boxes can be used to show vital information (such as CTA’s or critical data). And you can equally use them for your content or products summaries. When it comes boosting a website conversion, we all know how critical social proof is. With Thrive Architect, you can easily build appealing testimonies in seconds. It allows you to display images, borders, and choose your desired color. If you’re like me who’s NOT tech savvy, you know how difficult it is to build pricing tables. Sadly, there are not many good plugins available on the WordPress store to eliminate this problem. Here’s where Thrive Architect comes to rescue, it allows you to easily add fully customizable and responsive pricing tables to your pages in minutes. Want to display your CTA at the right time? You can decide on a custom time a particular content will show while reading a page on your website and display your CTA at the right time using this page builder. Twitter is one of the most powerful social media platforms out there, and if you want to generate more website traffic from Twitter, you need more tweets via your content. The “Click to tweet box” can help you boost your tweets by displaying beautiful click to tweet content within your blog posts. Are you planning to launch a new site, book, product or membership site? 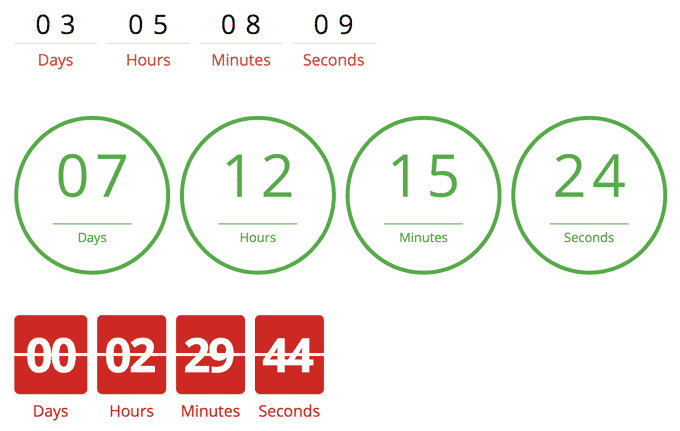 Do you wish to display a countdown timer on your pages? If yes, Thrive Architect can help you to achieve that. Simply drag and drop the countdown timer to your desired page, set your rules, and you’re good to go. Star rating reviews are one of the various ways to increase your website’s user engagement and product sales. Luckily, with Thrive Architect, you can easily add good-looking star ratings for your product review posts. You don’t need any extra WordPress plugin for this! Having an active email list is one of the best things you can do for your online business. With this content builder, you can effortlessly add mesmerizing email opt-in forms wherever you want within your pages, and however, you want it (color, size, links, etc.). Thrive Leads is one of the widely used lead generation plugins for WordPress. Whether your goal is to grow your email list or to persuade your visitors to take some other action on your website, Thrive Leads can help boost your conversion rates. Thrive Leads primarily focuses on helping you display email opt-in forms and pop-ups on your site. Apart from the opt-in forms, you can also use these pop-ups to show any type of content, including, videos, products, text, images, calls to action, etc. Thanks to the Thrive Leads editor, which gives you full control over how these forms look. It equally has A/B testing feature to help you further optimize the content. Multiple sign-up forms type, including two-step opt-ins, screen fillers, pop-ups, in-content forms, content locks, etc. Furthermore, Thrive Leads is a powerful lead generation tool that rubs shoulder with the majority of other similar WordPress plugins such as Bloom and OptinMonster. According to David Ogilvy, “on average, 5X as many people read the headline as read the body copy. Bearing that in mind, it’s of utmost importance to ensure your blog post titles are adequately optimized to attract your reader’s attention and induce them to click through to the article. Fortunately, Thrive Headline Optimizer WordPress plugin was built to help you achieve that as it has the ability to determine the most effective titles for your blog posts. With the help of the Headline Optimizer, you can effortlessly identify the titles you’d like to optimize for particular content, after which you’ll be required to enter multiple titles for that blog post to determine the best performer. In the end, this headline optimization plugin will then show the different title variations to your visitors, thereby tracking their individual engagement to find the winner. Finally, Thrive Headline Optimizer can also help you to identify which article titles reduce your bounce rate and keep visitors longer on your website. Setting up multiple sidebars for each category or tag on your site is indeed challenging, especially if you have zero coding experience, thanks to Thrive Clever Widget WordPress plugin. The plugin is a part of the Thrive Themes membership, and it gives you total control of all your widgets. Furthermore, Thrive Clever Widget also lets you determine exactly where your widget content should be shown to your audience, based on tags, categories, post types and also include and exclude rules for specific pages. Good stuff right? One of the most effective ways to increase conversions on your website and products is by using Urgency and Scarcity; this is due to the principle of Loss-Aversion (the fear of losing out). I’ve seen this approach work for many marketers, and I’m pretty sure it’ll also perform wonders for you if properly implemented. As humans, we’re often more likely to take action on something if we know that we'll lose out on something vital if we don't take action. This is the thing that made a lot of people to invest their life savings in Cryptocurrency earlier this year when the market was booming. I invested too, and I’m sure you probably did. Although, I didn’t invest my lifesaving :). Now, if you decide to implement this principle on your website and landing pages, then the Thrive Ultimatum plugin will help you to achieve that effortlessly. Admittedly, there are many other countdown timers plugins out there, but the advantage Thrive Ultimatum has over all of them is that it can create evergreen and standard countdown timers. And aside from that, it equally has fantastic expiring links and bulletproof tracking that prevents people from gaming your scarcity offers. With this feature, you can easily run visitor specific countdown timers, and it’ll be different per visitor. 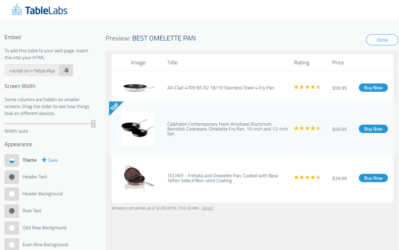 This is a fantastic way to automate your products sales and services. Thrive Ovation WordPress plugin is one of the newest product by Thrive Themes. Obviously, managing multiple testimonials can be a daunting task for most bloggers, freelancers, and business owners. It’ll be confusing for newbies, and if it’s not handled correctly, you’ll have a difficult time digging through the archive in the future. Thrive Themes is a very successful product and as such, it gets lots of positive reviews each month from its users, the idea of managing all these testimonials was just so challenging. Hence, the introduction of Thrive Ovation. In a simple term, Thrive Ovation puts testimonials on steroids, and it helps you to find testimonials in a matter of seconds. 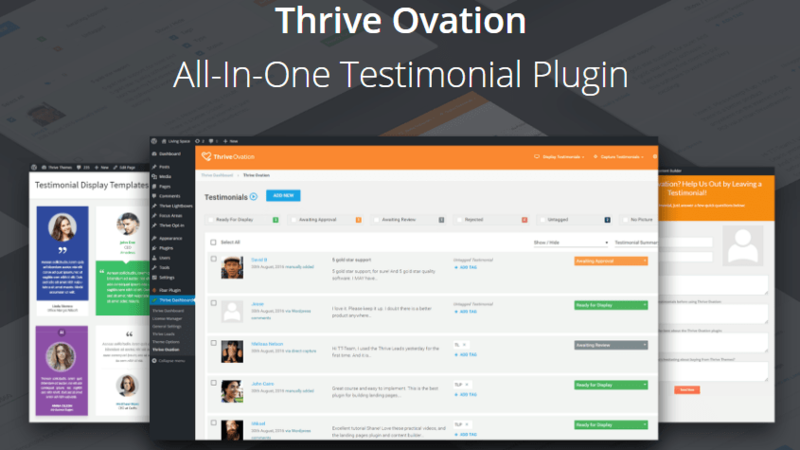 In other words, Thrive Ovation is simply a set and forget testimonial plugin for WordPress users. If you sell a product, services on your website, or if you’re using testimonials to boost conversion, then the Thrive Ovation plugin is meant for you. This is one of the Thrive Themes products I’m really excited about, even though I’m yet to use it on my blog, but I sure will soon. 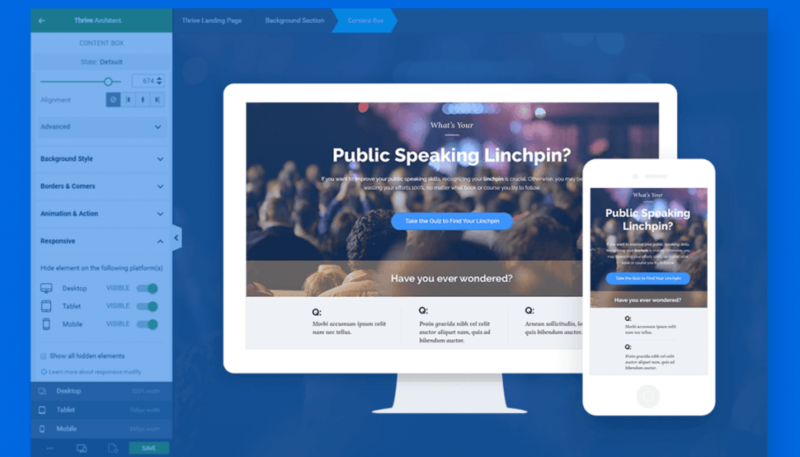 Quizzes are known to be incredibly fun and super addictive, which is why the Thrive Themes brand decided to turn this simple tactic into a tremendous marketing tactic to help you convert more website visitors into email subscribers and paying customers. Ideally, Thrive Quiz is a powerful way to engage your audience with your content. It's equally a good way to segment your readers based on the topics they’re most interested in. With Thrive Quiz, building a quiz is pretty easy. You have three options to start with. Additionally, the “List Building” and “Social Shares” options offer you pre-made templates which makes the entire process much faster. Thrive Quiz Builder lets you build quizzes via a drag and drop editor, and once you have created at least one quiz, you’ll find very straightforward stats and reporting. 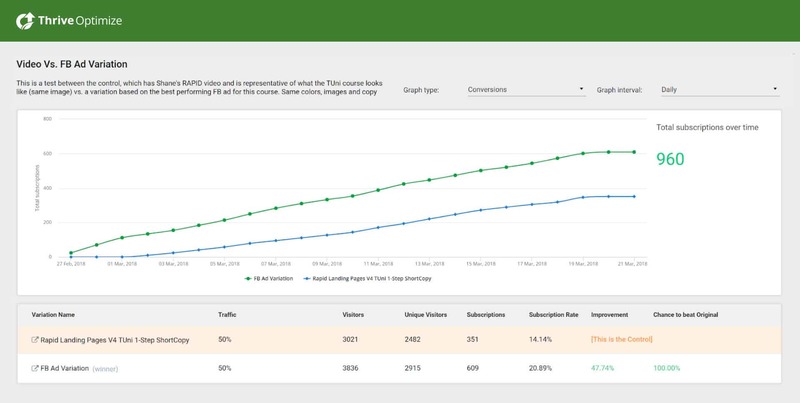 If you've been thinking of how to split-test and thoroughly analyze traffic to your website or landing pages, you can now do that with Thrive Optimize. 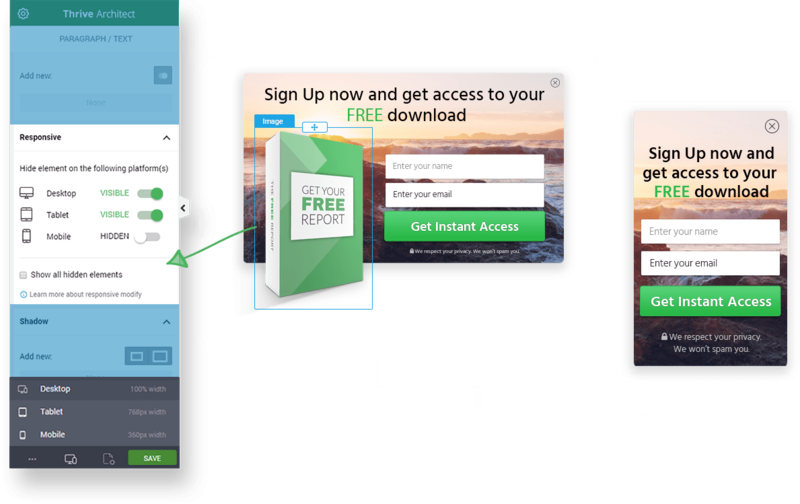 In split testing, knowing which element works better is very important – and if you’re always guessing what works when building landing pages, then Thrive Optimize is here for your rescue. With the Thrive Optimize plugin, you’re no longer required to depend on guesswork – as it lets you test any page or element in real time. 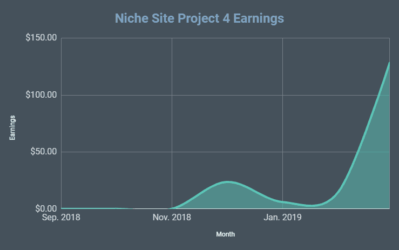 The report above was generated via Thrive Optimize, and it’s well detailed, and more importantly, it is pretty easy to understand. The key differentiating features of Thrive Theme compared to other premium WordPress theme companies are the depth of their support documentation. Most other WordPress themes lack proper and in-depth documentation, while Thrive Themes’ documentation is one of the best in the industry. Not only do they offer you lots of text tutorials, you equally have access to high-quality video tutorials for most of the features. These video tutorials don’t just teach you how to use the products – they make sure you get the best value from all the Thrive Themes product you purchased. Additionally, talking about Thrive Themes support, paying customers are also able to raise a ticket on their support forum 24/7, and you’ll get a response in a matter of 30 minutes. Over the years, I’ve reviewed lots of WordPress tools – and I can tell you that the support forum of Thrive Themes is one of the busiest you’ll ever find, and their support teams are always eager and happy to help in any possible way. Thrive Themes has equally created a central portal inside the WordPress dashboard where you can access, manage, and setup their products. By clicking on “Thrive Dashboard” inside your WordPress dashboard, you can access the Thrive Themes installed products section. This section will grow as you install more Thrive products on your blog. For example, you can see there are five plugins and one theme installed. API Connections – The API connections are used for connecting Thrive Leads to various services such as your email marketing system, email delivery services, reCaptcha, and lots more. Custom Fonts – This enables you to easily add and edit different custom fonts you want to use in your Thrive products. 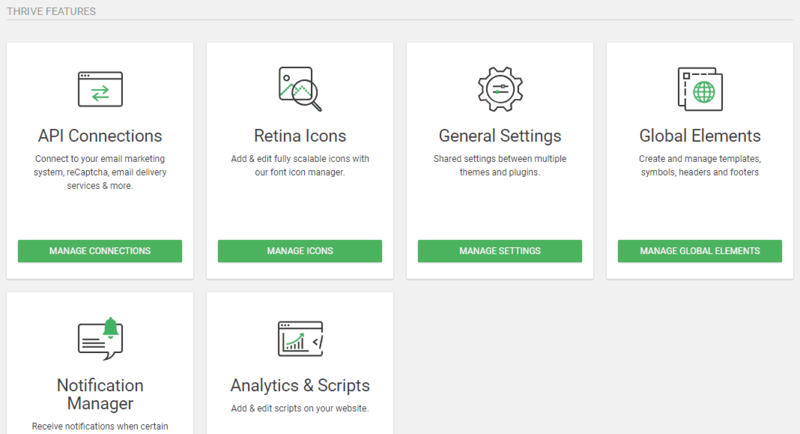 Retina Icons – The Retina Icons helps you to add and edit scalable icons with the font icon manager, which you can use in the visual editor on many plugins. General Settings – You can use this for shared settings between multiple plugins and themes such as the Facebook App ID and others. Notification Manager – This option enables you to get notifications when certain events happen on your website such as when someone opts into your Thrive Leads opt-in forms, and when an A/B split Test is concluded in Thrive Headline Optimizer. Analytics & Scripts – This is the last option, and it allows you to easily add and edit different scripts on your website. 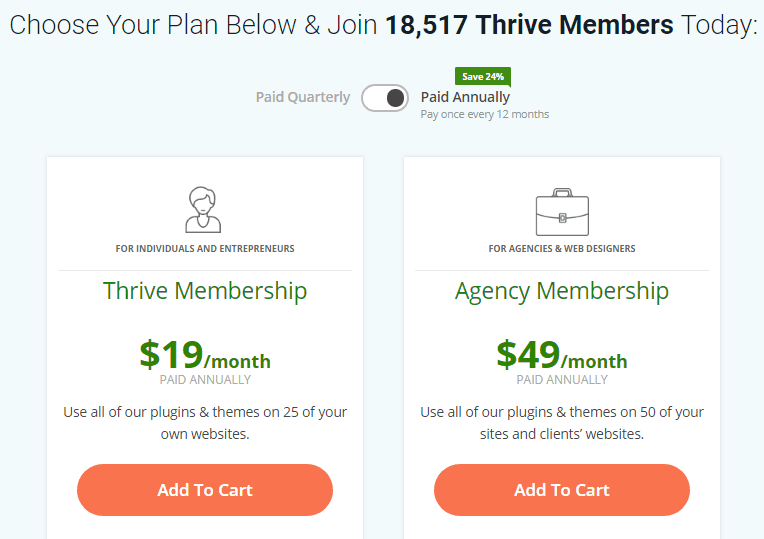 Thrive Themes Pricing | what’s the Cost? Going for the Thrive Membership package means you’ll have access to their products for life. If you ask me, I think that’s an excellent incentive because Thrive is always adding new themes and products to the range, so you have a lot to gain. With Thrive membership, you’ll have full access to all their current and future products, enhancements and updates, and even ongoing support. Here are some of the most frequently asked questions about Thrive themes and their answers. Go through them if you’re still not sure whether Thrive themes is for you or not. 1. What comes with Thrive membership and how much does it cost? 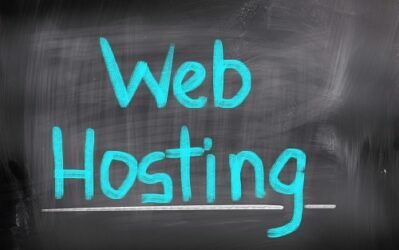 It comes with full access to all their WordPress themes and plugins, plus ongoing customer support. Refer to the pricing section above for more. 2. So what makes Thrive Themes unique from other WordPress themes? Thrive themes are generally known as conversion focused WordPress themes which are built to boost your website conversion rates. 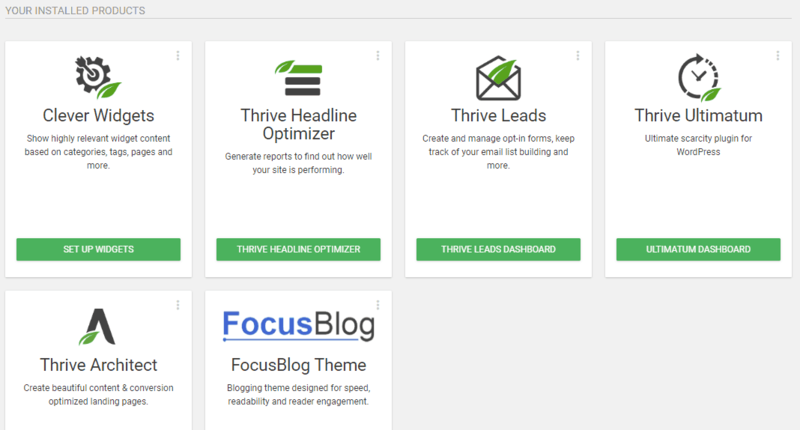 If getting a theme with higher conversion rates is your concern, then give Thrive themes a try today. 3. How many websites can I use Thrive themes on? Thrive themes offers two types of pricing. Thrive membership package is more affordable and lets you install Thrive themes on up to twenty-five of your own sites. While Thrive Agency membership enables you to install their themes on up to fifty of your websites and that of clients’. 4. Is it worth investing in a premium WordPress theme such as Thrive themes? The primary reason people often choose premium WordPress themes over the free ones is that premium themes are more secure, faster loading and quick customer support. On the other hand, free theme developers don’t give you any support needed to customize the themes. And most free themes are often prone to hacking due to fewer updates. Therefore, if you want a simple and unique design for your blog, going for a premium WordPress theme such as Thrive themes is the best option. 5. What if I don’t like Thrive themes after my purchase? If you have problems with Thrive themes or its features after your purchase, you can easily contact their customer support 24/7. However, if you are still not happy with their products, you can get a refund within 30-days of your purchase. It’s also worth stating that if you’ve paid a yearly subscription for Thrive membership, you’re free to cancel your account anytime, but you won’t get any refund after the 30 days. As you can see, the Thrive Membership Scheme offers great value for money. You’ll be able to save lots of money with the membership plans compared to buying their plugins and themes individually. However, the pricing is not the only attractive feature. Thrive developed an excellent membership dashboard that it’s very easy to navigate – and it gives you access to all the relevant information, from licenses to documentation/tutorials. There are no mistakes in the Thrive Themes product suite. All of the plugins and themes are built to the highest standard and are continually updated. Therefore, I’ll urge you to try Thrive Themes today, and you won’t regret it. Have you ever tried any Thrive product before? If yes, please share your experience with us in the comment section.